The Coated German Shepherd, exactly what is a Coated German Shepherd you may ask? As far as I'm concerned, and this is only my personal opinion (based on years of experience with this breed), the German Shepherd Dog only has three basic coat lengths - short, plush and long - with varying lengths of coat fullness in between the three. Coated GSD's can easily be distinguished from the shorter or plush coated type by those long tufts of hair, often called "feathering" or "feathers", behind their ears and also on the backs of their legs and belly. They also have really full, bushy tails. 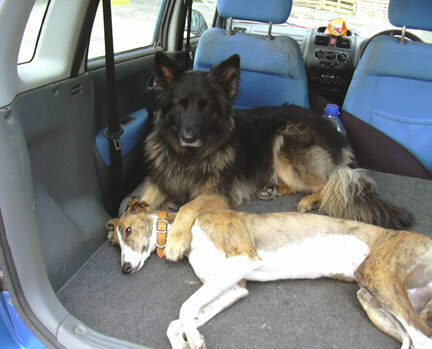 The short or plush coat is what you see most often and is what is considered correct according to the breed standard. In fact, I would guess easily over 85% or more of the GSD population is short or plush coated. 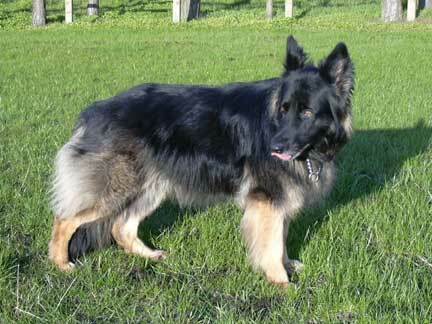 This is considered the standard, and is the basic or acceptable stock coat length of the German Shepherd Dog. Then there is the longer coat. Though not acceptable as far as the breed standard goes, these dogs are often referred to as "coated" German Shepherds or "long coated" German Shepherds, all referring to that longer than standard coat. As far as the standard is concerned (when speaking of the German Shepherds coat it particular), the coat of the coated German Shepherd, aka, long coated German Shepherd Dog, is considered a fault according to both the AKC and the International (FCI) breed standard. Why is this considered a fault you may ask? Here's the thinking behind the standard: that a longer coated German Shepherd is greatly diminished in weatherproofing because of a lack of undercoat and therefore is undesirable (per the breed standard). 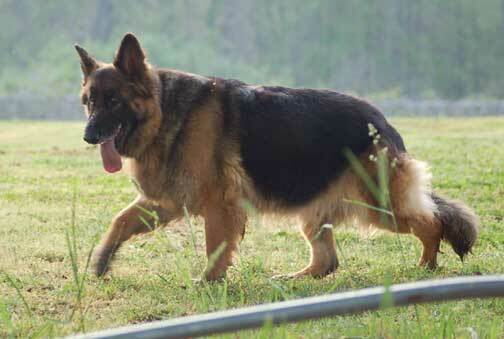 Have you seen one of these long haired German Shepherds? Simply stunning if you ask me, and a true beauty to behold. And more grooming too, but that is another thing entirely. But I must admit, it seems my short coated GSD sheds much MORE than my two coated girls, though this may be entirely coincidental and is only based on my own personal experience. The long hair gene in the German Shepherd Dog breed is considered a recessive gene - some refer to it as the "coat factor". 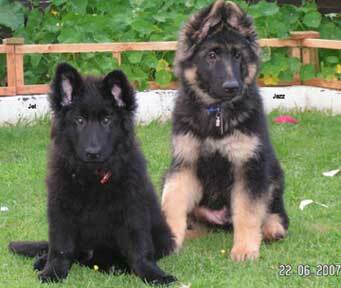 It is a possibility that two otherwise "normal" coated GSD's could produce long haired puppies. This is because each of these parent dogs carry the recessive "coated" gene. 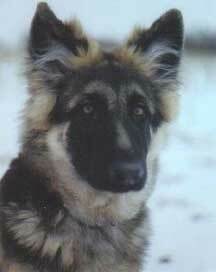 If either of these two regular coated parent German Shepherds in the example above were then bred to other German Shepherds that do not carry the coated gene then both could potentially produce litters without any long coated puppies at all. In order to have long coated GSD puppies, each of the parent dogs must carry the recessive "coated" gene for long coated GSD pups to be produced. As far as I'm concerned there is simply no reason to avoid these coated German Shepherds (if you don't intend to show your dog in conformation competitions). These coated GSD's can and do compete just as well as their shorter haired counterparts in all forms of obedience, search and rescue, agility or any other working disciplines. In Europe it seems that a lot of police service dogs or other working GSD's are coated dogs. The coat of the German Shepherd simply has no effect on their working ability and unless you are a breeder the whole issue of coat, long or short, should not be of a real concern to you. Concerning coat terms, I am often asked exactly what I consider a plush coat.Basically, I consider a German Shepherd with a regular length coat (maybe just a bit longer in length even) that has a fuller, thicker in texture coat of fur to be a "plush" coat - but not a coated German Shepherd.Think of it this way, compare someone who has a regular full head of thick hair (maybe like the actor Patrick Dempsey) to another person with a military buzz cut. That is what I think of when I think of a plush coated German Shepherd - a German Shepherd with a thick, full coat of hair - kind of like GSD version of Patrick Dempsey. 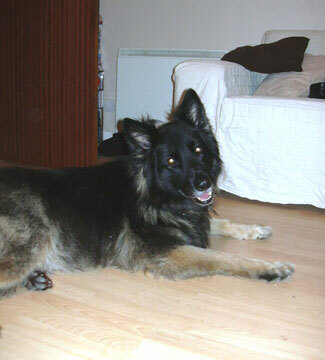 This particular coat type, possessed by the long haired German Shepherd, is often not considered as weatherproof as the regular stock coat. However, if there is sufficient undercoat, the coated German Shepherd should do just as well outside as their short coated GSD counterparts.Believe me, my own coated German Shepherds do just fine when performing outdoors in wet, cold or otherwise yucky weather - much better than me, that's for sure. And my coated girls coat does throw off snow, rain, sleet - you name it, while keeping them dry underneath. One big thing to remember, the longer coated GSD does require more attention concerning grooming. If you plan to use your longer haired German Shepherd for work or play in any areas such as open grassy fields, forests, etc., then these dogs will take longer to groom afterwards because dirt, foxtails, burrs, etc. are all picked up more easily by their longer coat and can definitely cause tangles and other coat problems if not taken care of right away. 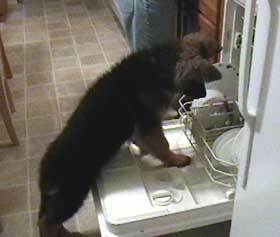 All in all, a German Shepherd is a German Shepherd is a German Shepherd as far as I am concerned. Things like coat length or coat color, or any other outside physical attributes have nothing to do at all with the dog's temperament, intelligence, ability to work, or it's capability of being the best pet you'll ever have. When looking for a new German Shepherd to bring into your home, as far as I'm concerned, this should be the absolute last thing on your list of qualifications when making your decision as to which German Shepherd will be your new best friend.